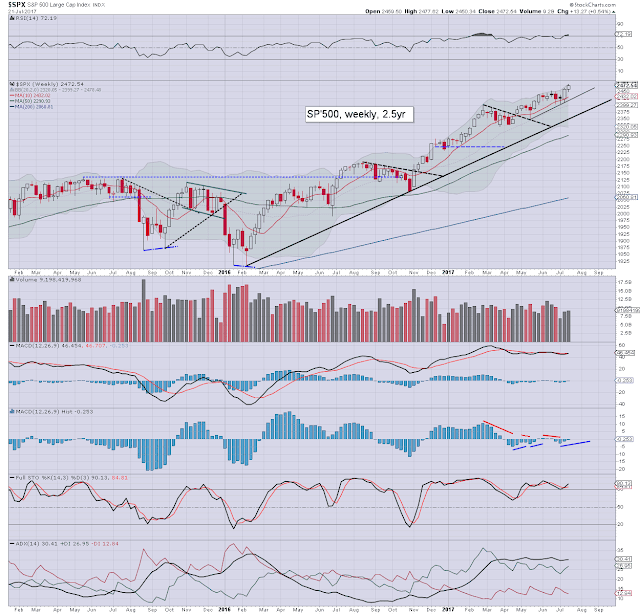 US equity indexes closed on the weaker side, sp -1.8pts at 2470. The two leaders - Trans/R2K, settled lower by -0.5% and -0.3% respectively. VIX settled -0.3% at 10.26. 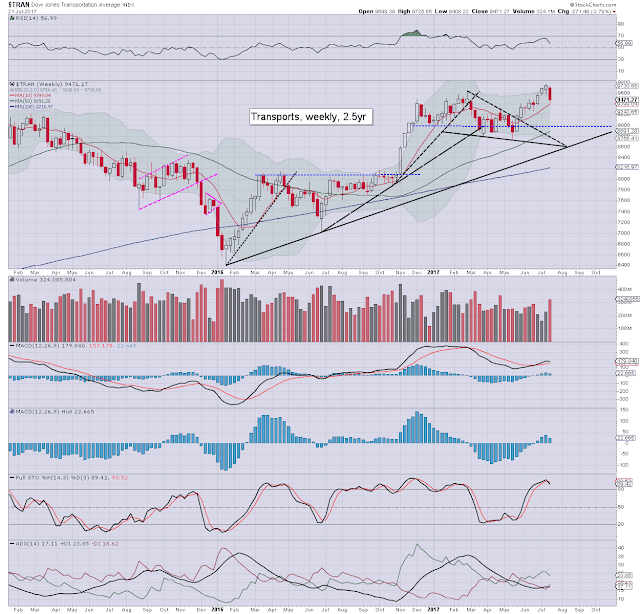 Near term outlook offers a sig' down day to at least partly fill the gap zone of 2435/25. US equities opened moderately mixed, and remained that way into the monthly close. 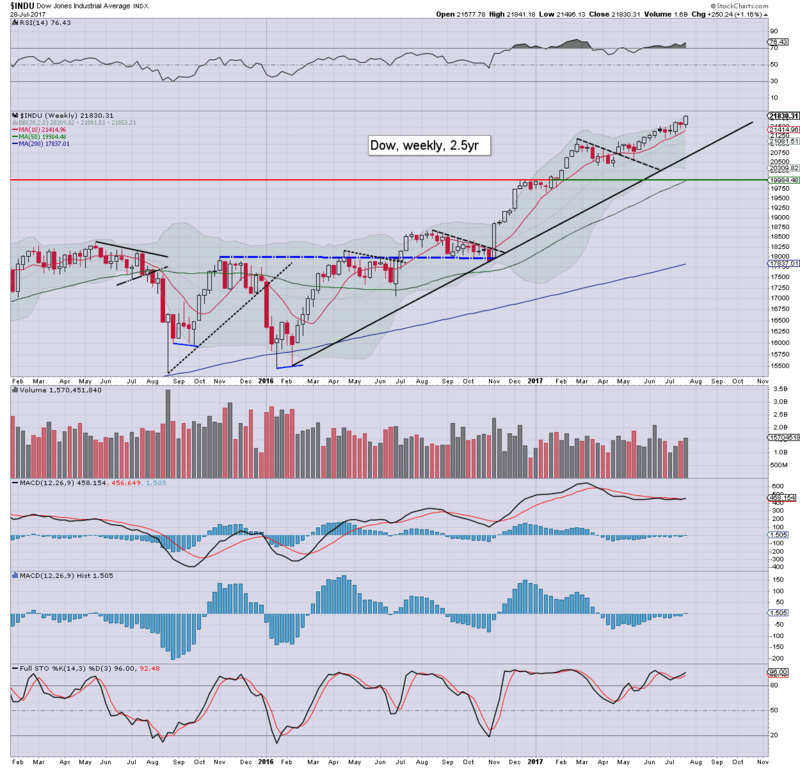 The Dow did break a new historic high, whilst the sp' closed net lower for a third day. There is indeed some disparity between the indexes. 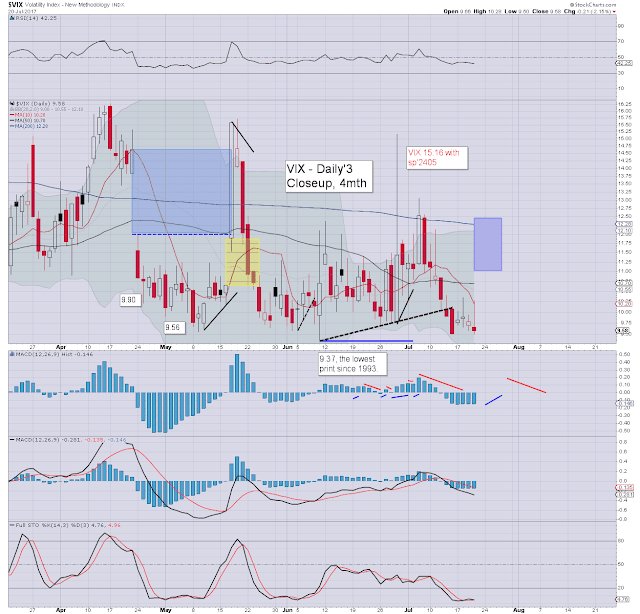 Market volatility remains very subdued, and its notable that despite equities leaning a little lower in the closing minutes, there were some 'games' being played, with the VIX actually knocked from 10.64 to 10.26. 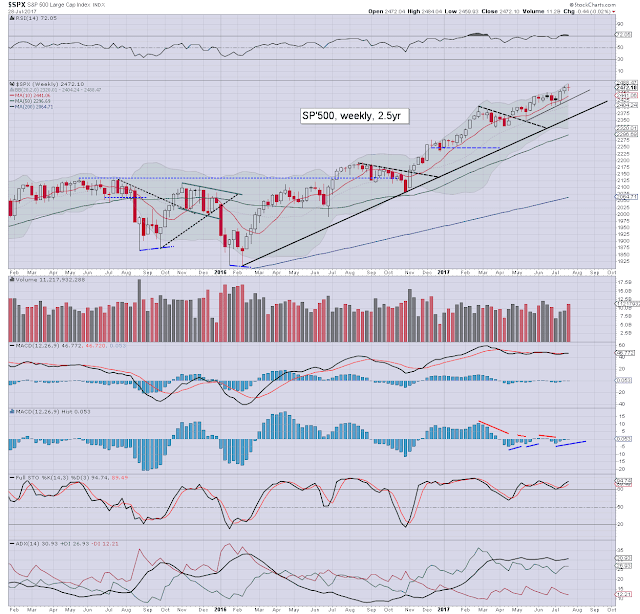 Near term offers sp'2435, and that should equate to VIX in the 12s, the 13/14s on a stretch.. and briefly! 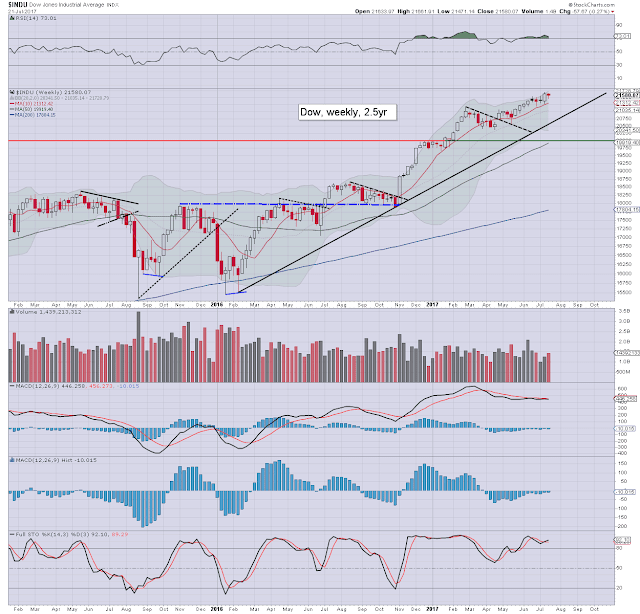 A fourth consecutive net monthly gain of 46pts (1.9%) to 2470, with a notable new historic high of 2484. 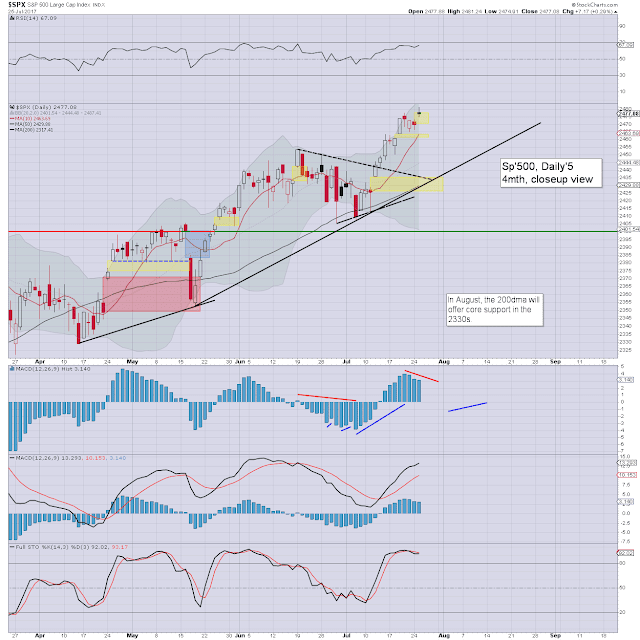 ... a short term bearish ray of light for the equity bears to sp'2435. US equity indexes closed moderately mixed, sp -3pts at 2472. The two leaders - Trans/R2K, settled +0.4% and -0.3% respectively. VIX settled 1.8% at 10.29. Near term outlook offers a sig' wave lower to sp'2435 on Monday. Things would only get marginally exciting with any price action <2425, but that looks very unlikely. 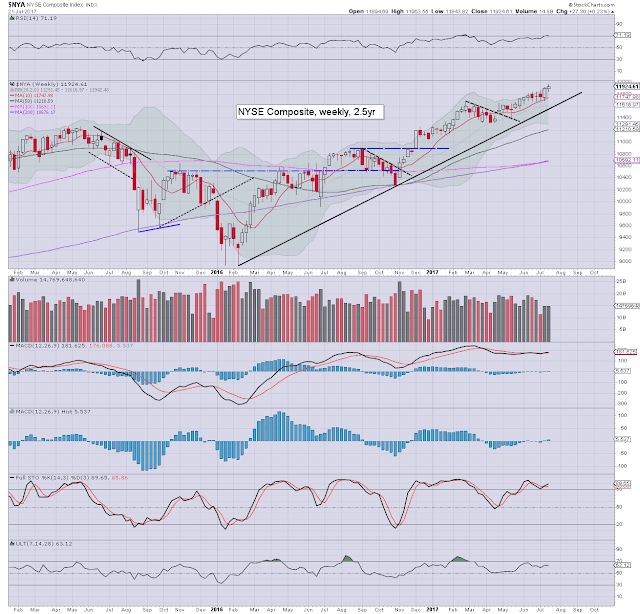 US equities ended the week with a fair amount of moderate chop. 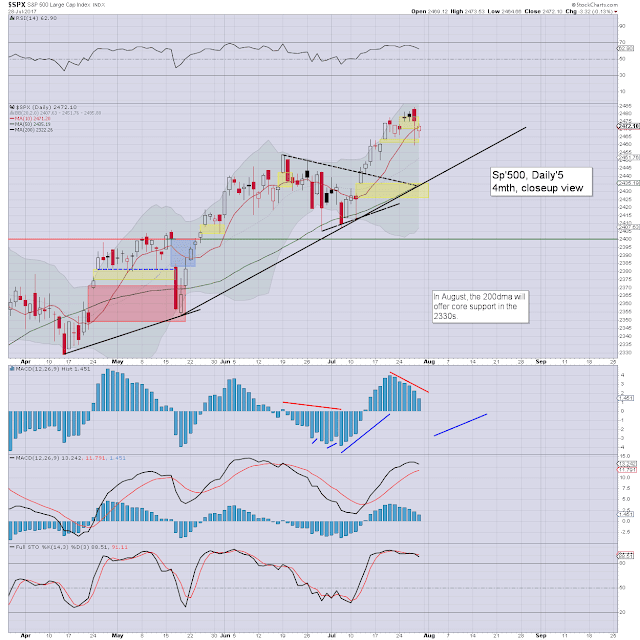 The settling candle was of the reversal type, but there is little reason to believe the market won't resume lower next Monday. Underlying MACD (blue bar histogram) cycle is set for a bearish cross late Monday, or certainly at the Tuesday open. 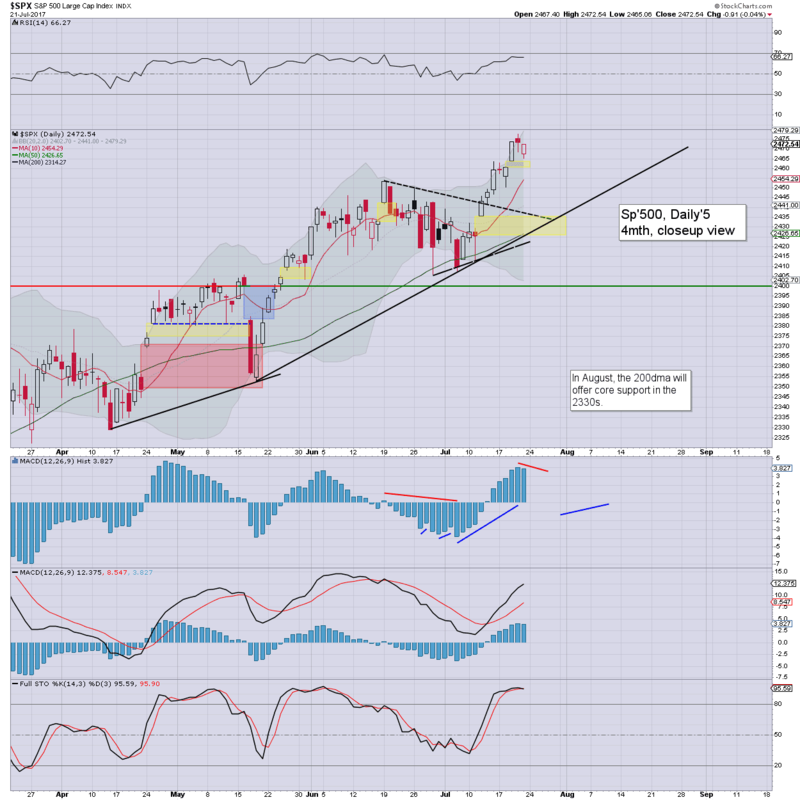 Prime target remains sp'2435. 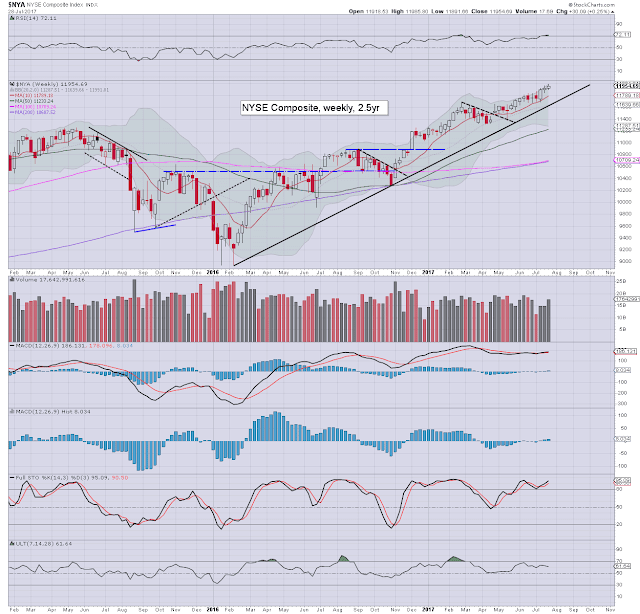 Things would get 'interesting' with any price action <2425, but that looks very unlikely. Keep in mind, today saw the Dow break (if fractional) a new historic high. 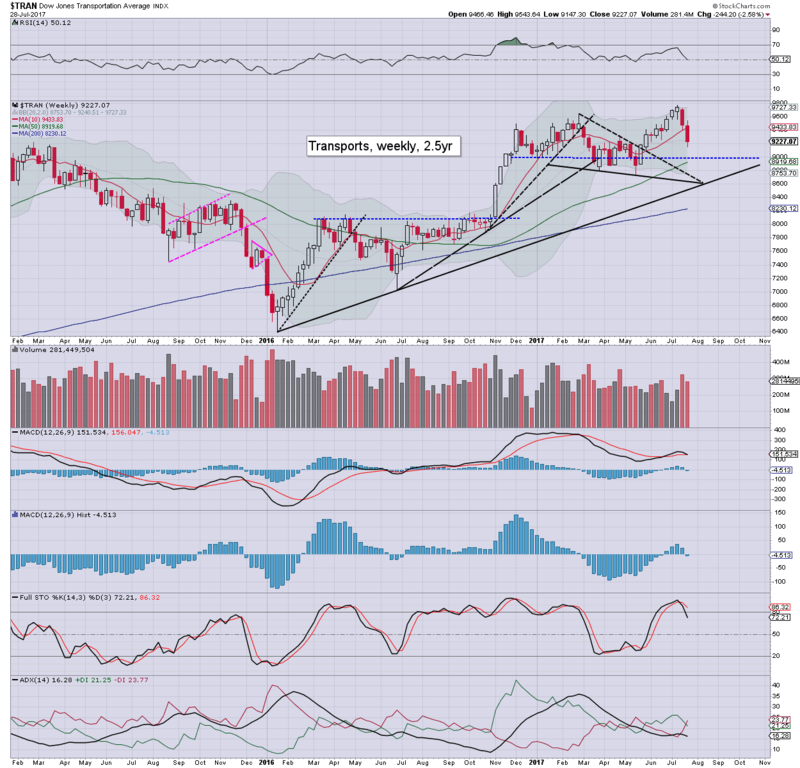 Broader price action remains 'scary strong'. As for volatility, the VIX saw a high of 11.30, but with a moderate equity recovery into the late afternoon, the VIX cooled. 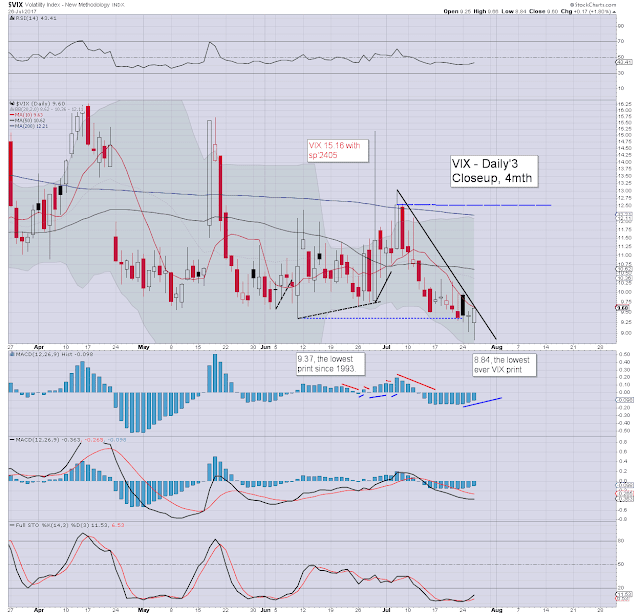 However, its notable that the VIX managed a fifth consecutive net daily gain, the best run since mid April. 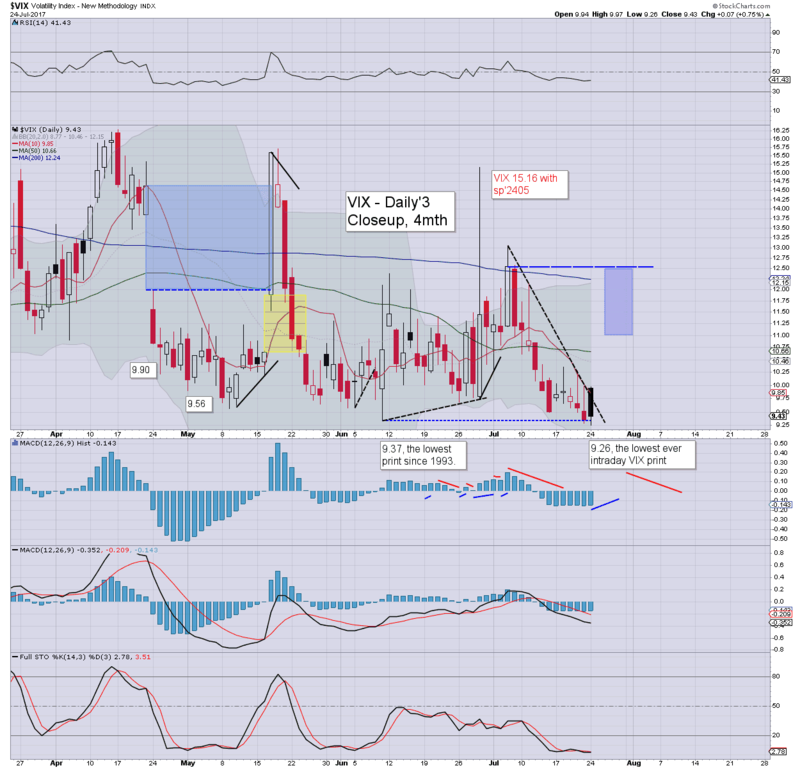 Further, the fact this occurred within a week where we saw VIX break a historic low of 8.84, is rather notable indeed. US equity indexes closed very mixed, sp -2pts at 2475 (intra range 2484/59). The two leaders - Trans/R2K, settled lower by -3.1% and -0.6% respectively. 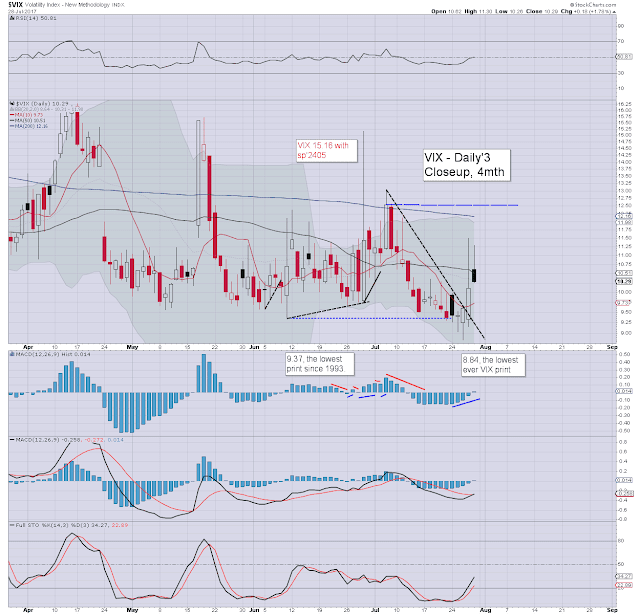 VIX settled +5.3% at 10.11. 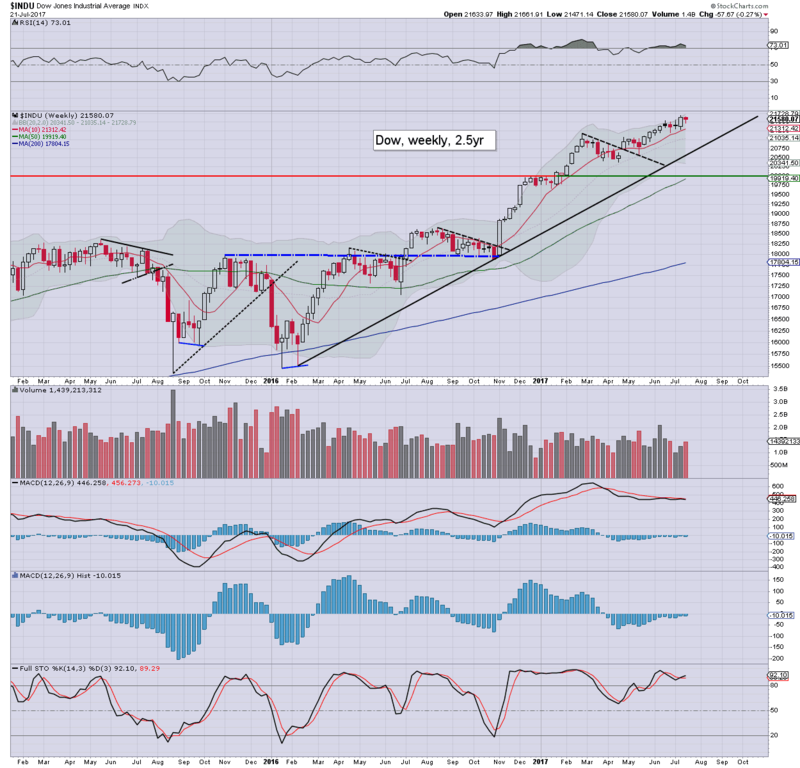 Near term outlook offers a partial gap fill to sp'2435, before resuming upward in August. *note how the Tues/Wed' black-fail candles in the sp'500 were subtle warnings of today's break lower. US equities opened very mixed, but with a notable trio of new historic highs for the sp', nasdaq comp', and the Dow. There was a very strong swing lower from 12pm onward, with the market filling the first, and secondary gap zones. 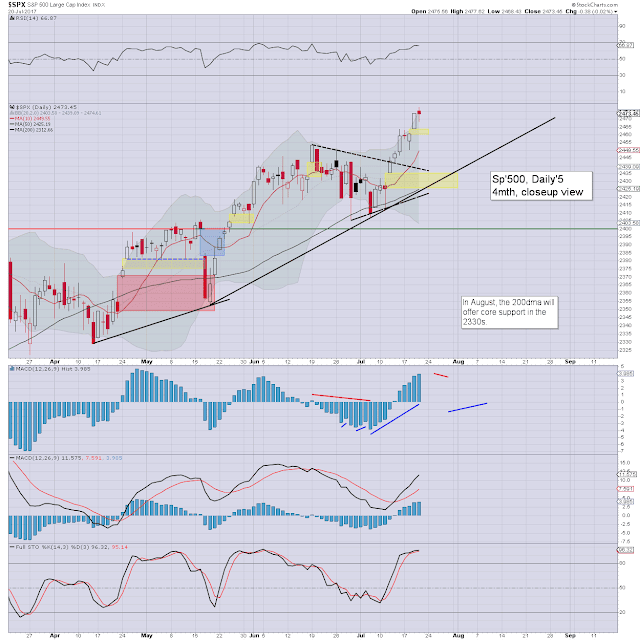 The third gap zone of sp'2435/25 remains set to be at least partly filled, before the market has a better chance at pushing into the 2500s. Market volatility saw a morning low of 9.16, but with equities swinging lower, the VIX saw a mini explosion into the mid 11s. 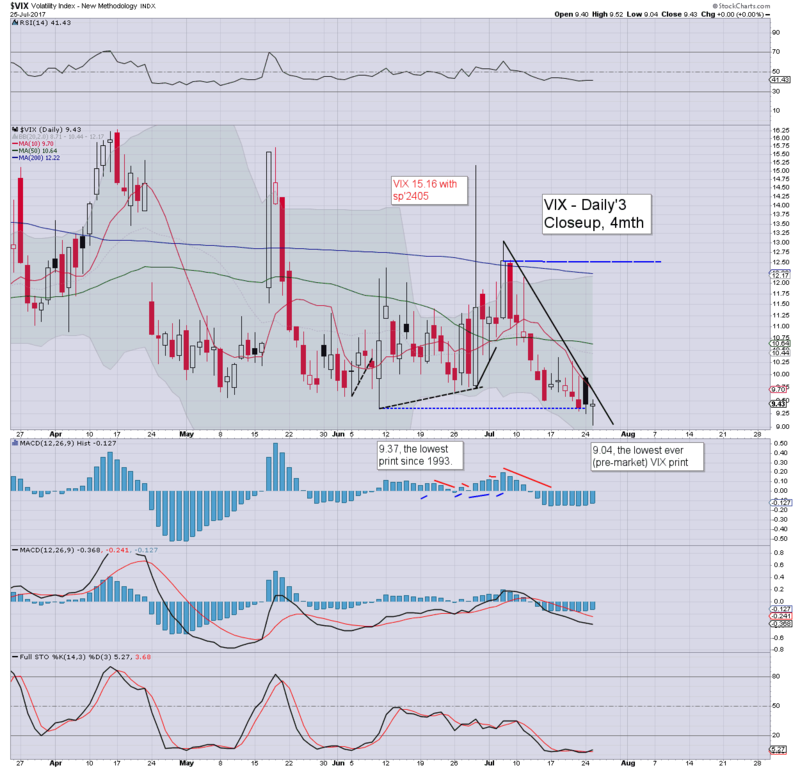 If sp'2430s, VIX will see the 12s. Earnings were lousy, with headline EPS of just 40 cents, with operating costs +28.2% to $37.33bn. If you extrapolate, that makes for an annual $1.60, giving a PE of 625 with the stock around $1000. 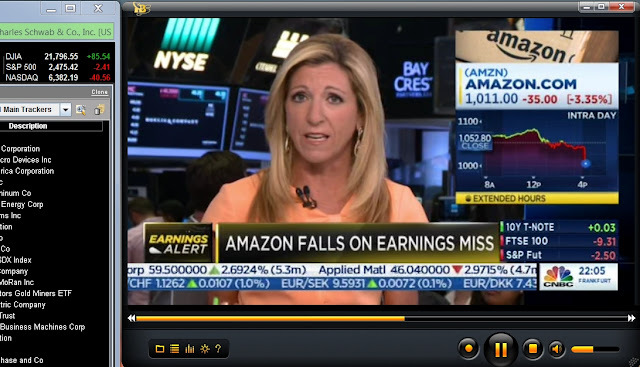 Ms. Link - whom I've never been a fan of, noted how "... you buy Amazon for top line growth, not profits'. Well, being within the mainstream, I can't blame her for towing that party line, but the financial historians won't look kindly on that kind of batshit crazy investment opinion. 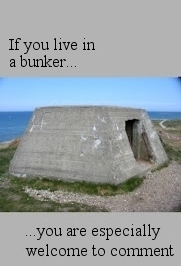 To be clear, I like the service, but as a company, its pure garbage. No significant profits, no dividends, and unquestionably, causing problems for thousands of retailers across the globe. Its notable that one of the few who is actually deriving an income from Amazon is Bezos. Perhaps he'll make it to Mars via Blue Origin, before this South Sea-esque bubble bursts? 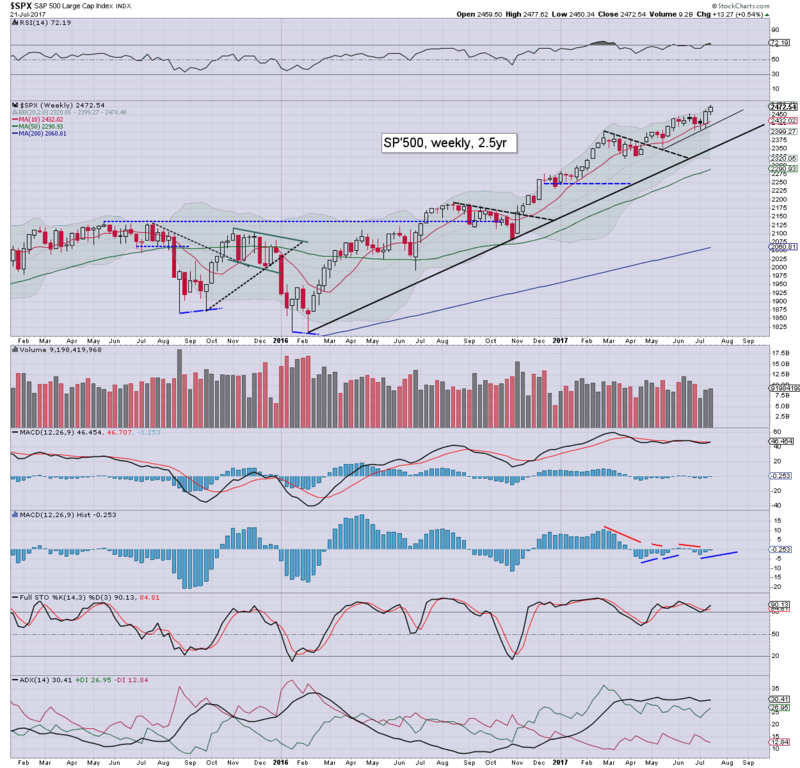 US equity indexes closed moderately mixed, sp +0.7pts at 2477. The two leaders - Trans/R2K, settled lower by -0.1% and -0.5% respectively. 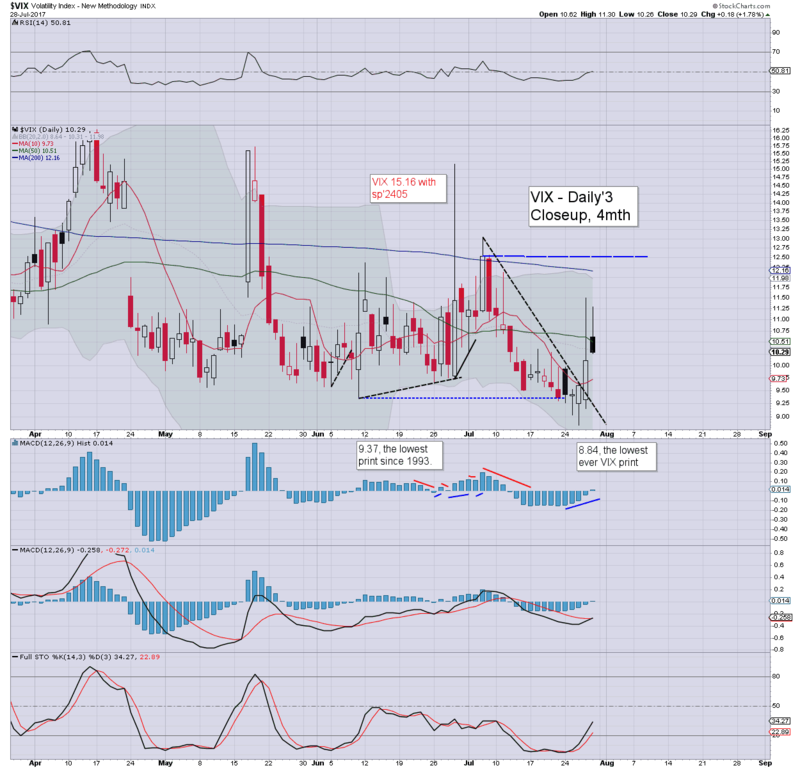 VIX settled +1.8% at 9.60. Near term outlook still offers a swing lower to the sp'2430s. Its notable though, that more within the mainstream are starting to tout the 2600/700s for year end. US equities saw a day of fed chop, with the sp' seeing a trading range of just 6.75pts. 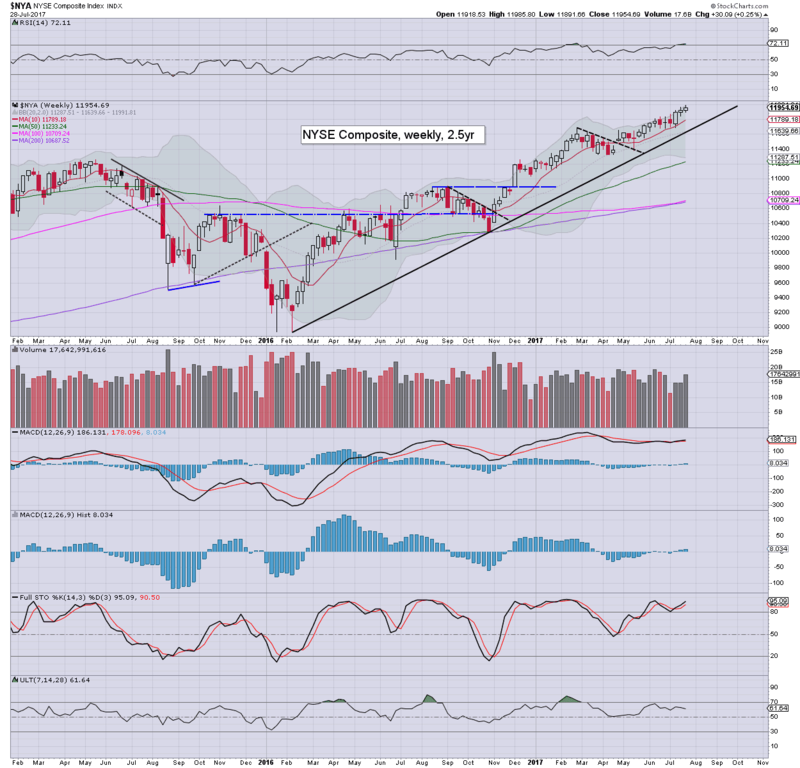 There were new historic highs (if only fractional) in the sp', nasdaq comp', and dow. 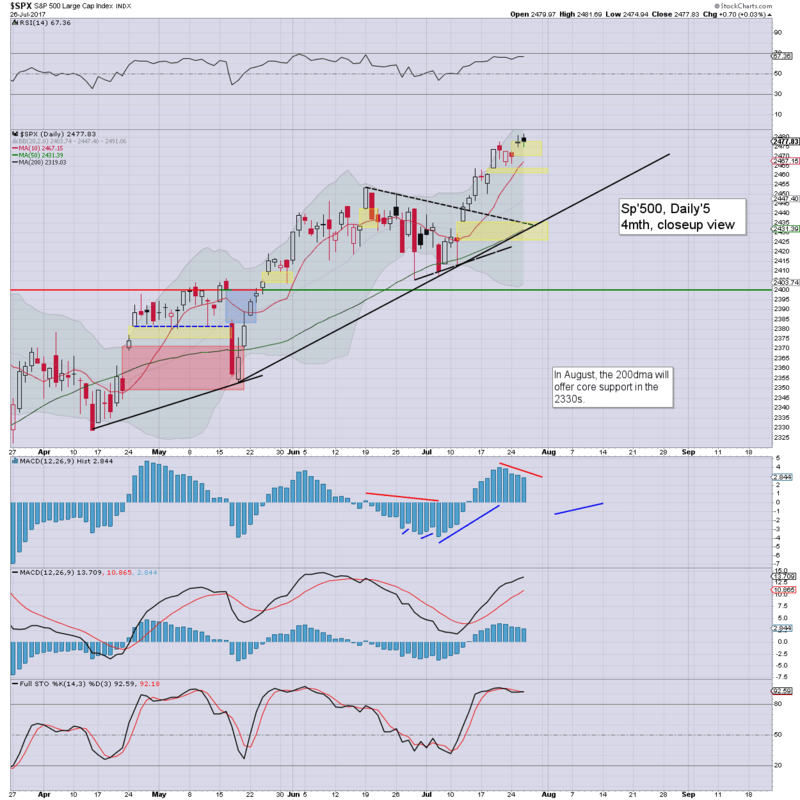 The NYSE comp' - or the 'master index', as I call it, settled with a black- fail candle, having fallen a touch shy of breaking a new historic high. Rising trend is currently in the 11770s. 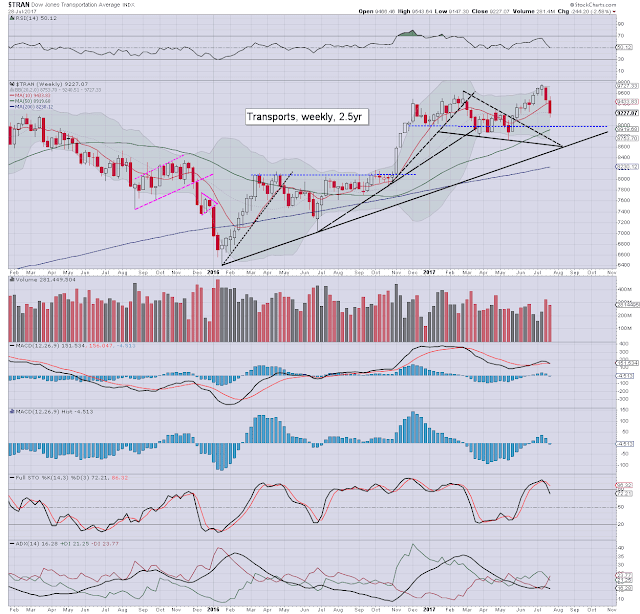 If that is broken, along with the 50dma, then yes... things would get interesting. 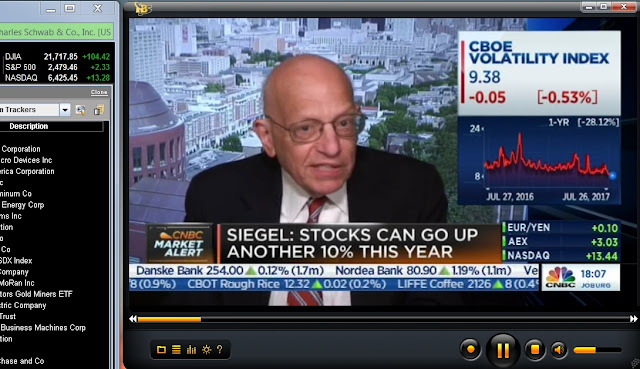 Its notable that today saw semi-regular guest Prof' Siegel tout another '10% of upside before year end'. 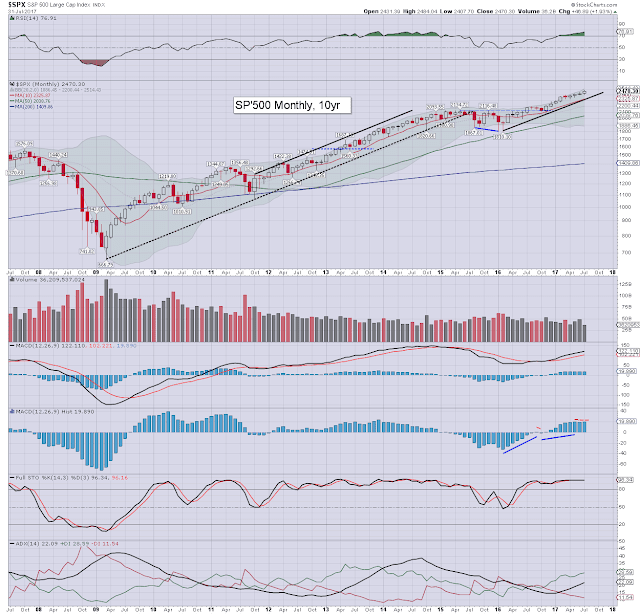 ... equating to the sp'2720s and Dow 23900s. 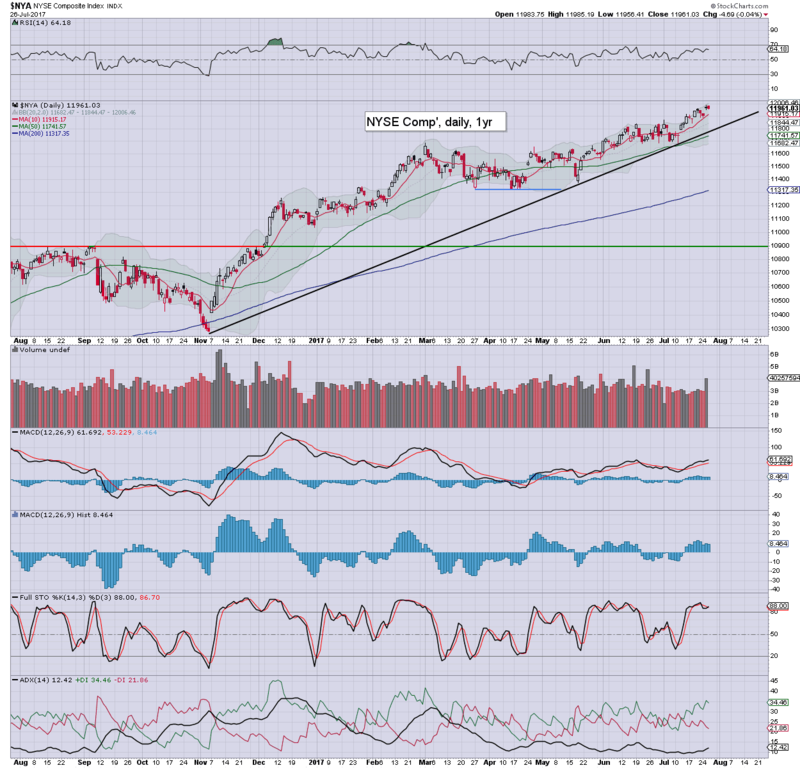 My year end target of 2683 remains on track, and is broadly shared by Oscar Carboni and Morgan Stanley. Market volatility was stuck in the 9s until the fed press release, which then saw a flash-print of 8.84.. a new historic low. ... and as the closing bell was about to ring... the grey horror clears for a few minutes of golden light. 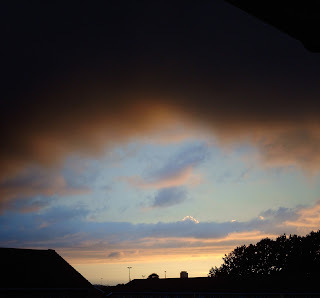 Yours truly should be somewhat far further south. 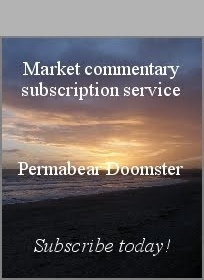 If you think I'm worth at least $1 per trading day... subscribe. ... or you should be able to buy 2 shares of SNAP within the relatively near term each month. 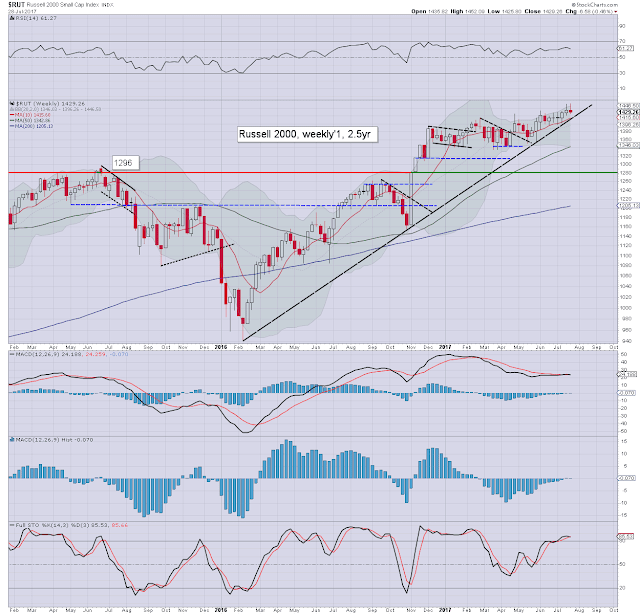 US equity indexes closed moderately higher, sp +7pts at 2477 (intra high 2481). The two leaders - Trans/R2K, settled higher by 0.7% and 0.9% respectively. 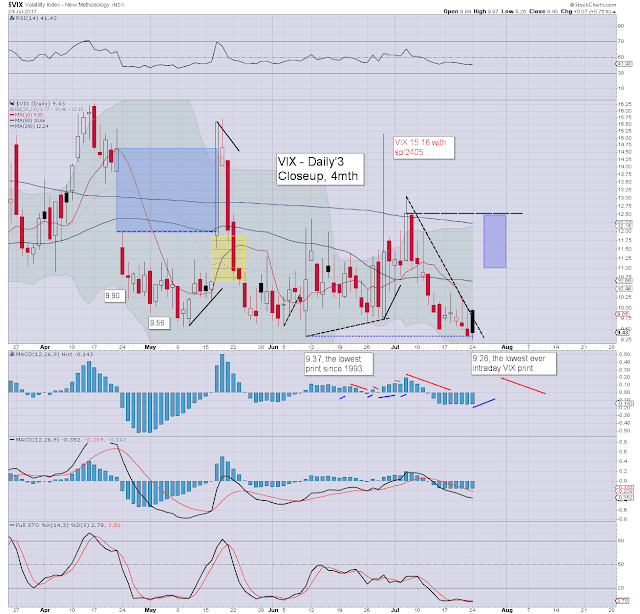 VIX settled u/c at 9.43. There are three open price gaps to the sp'2430s, and it'd be even more bizarre than VIX 8s, if those aren't filled within the near term. US equities opened moderately mixed, and battle slowly upward into the early afternoon, but that was enough to generate new historic highs in the sp'500, NYSE comp', and the R2K. 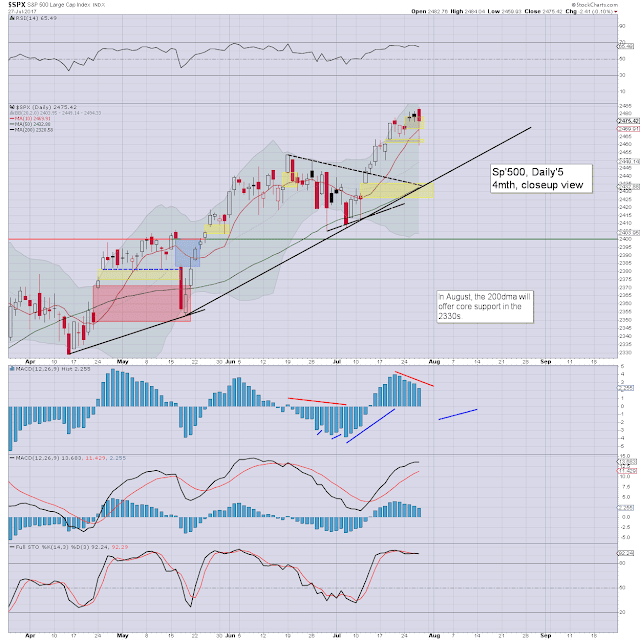 Its notable that the settling daily candle for the sp'500 was a black-fail doji. Those are suggestive of near term weakness. 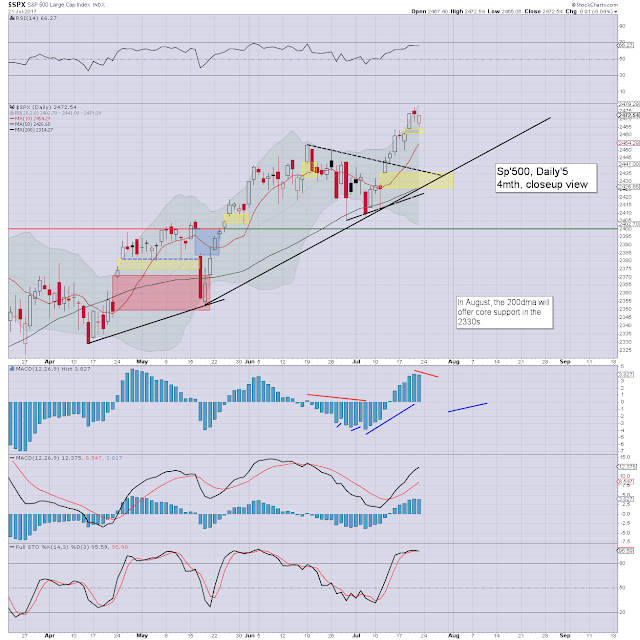 I fully admit I have been calling this for some days, but a retrace to at least partly fill the sp'2435/25 gap zone remains due. In the scheme of things, its only a small swing lower, 37pts (1.5%), and is entirely viable across just a few days. 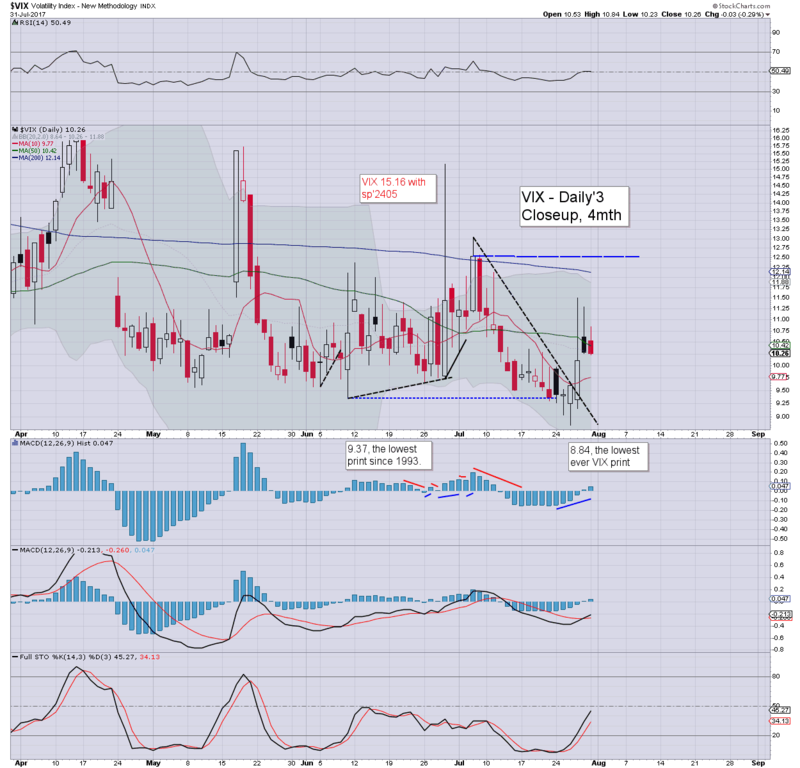 In pre-market, the VIX printed 9.04, which was yet another new historic low. 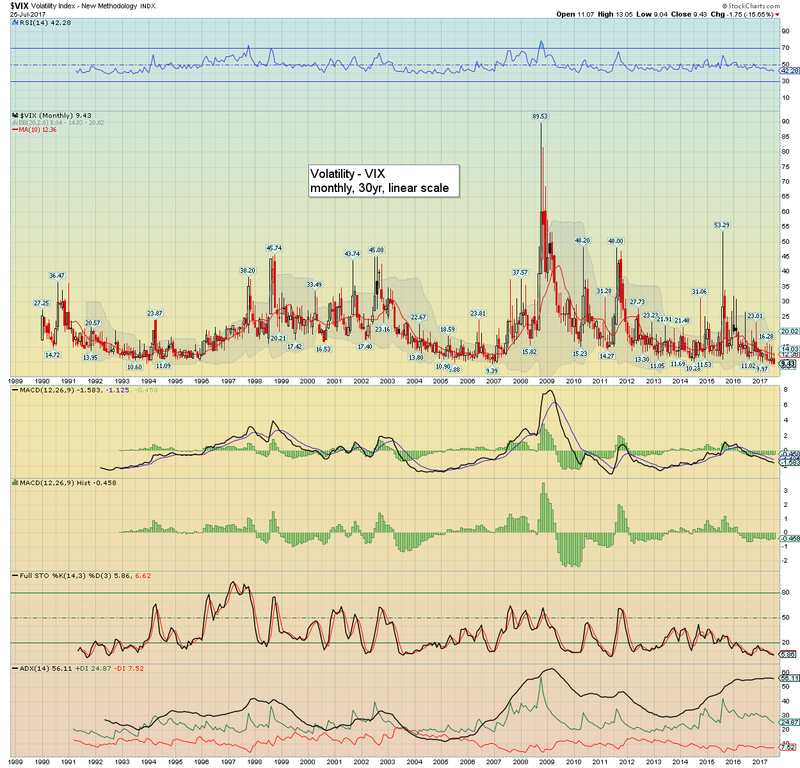 The actual intraday historic low was 9.05, with the VIX settling u/c at 9.43. 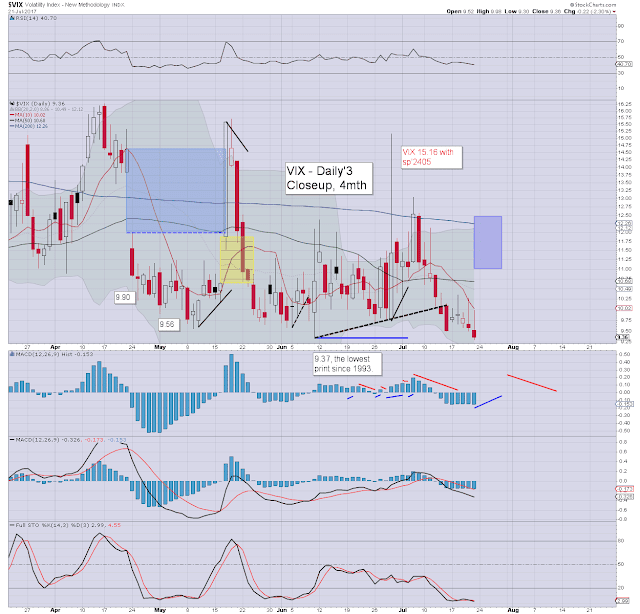 I have regularly touted - since last July, that the VIX-long trade is dead. Sure, we can see brief spikes, but the highs continue to be lower... with lower lows. 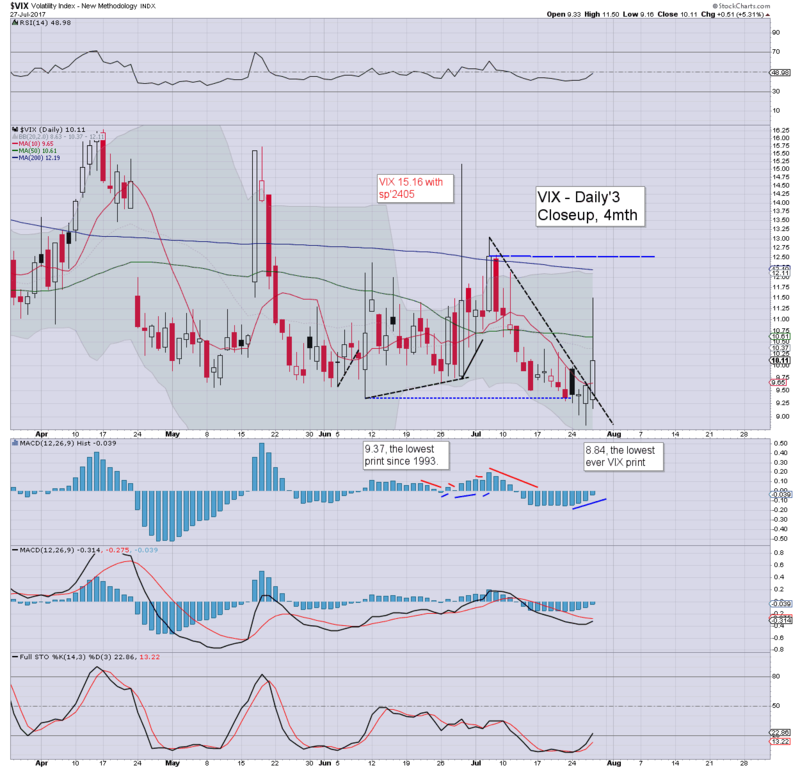 Even if sp'2435 in the near term, that probably won't even be enough to generate VIX 13s. US equity indexes closed moderately mixed, sp -2.6pts at 2469. The two leaders - Trans/R2K, settled -0.4% and +0.1% respectively. VIX settled +0.7% at 9.43. 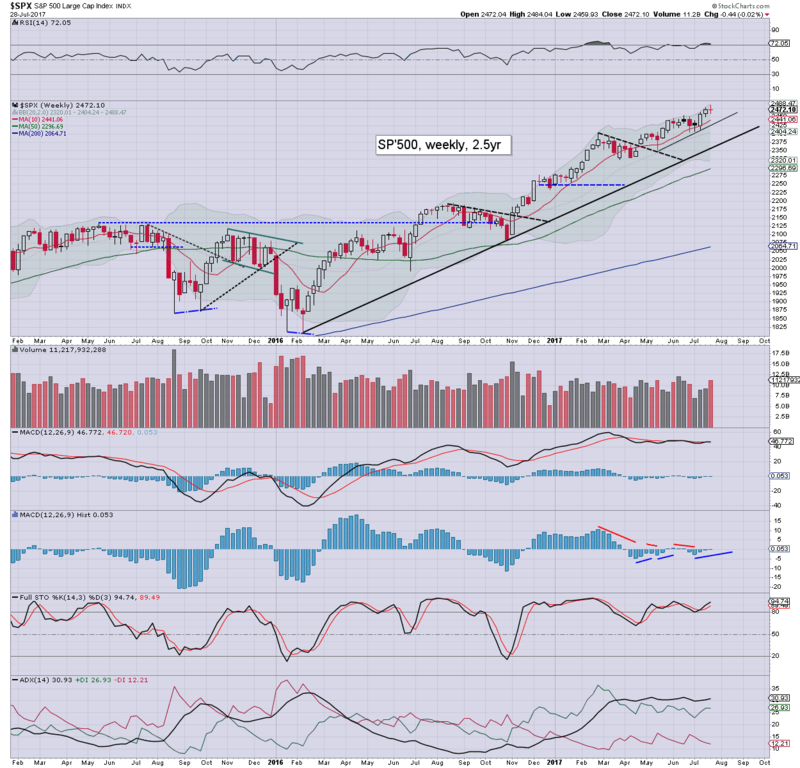 Near term outlook offers a brief foray to the sp'2430s. 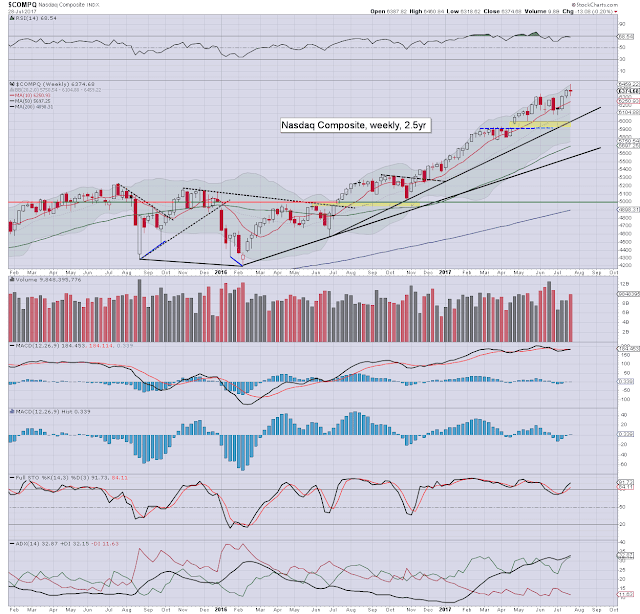 Mid term outlook remains bullish, supported by 'reasonable' earnings, and an economy that is ticking along with 2.0% growth. 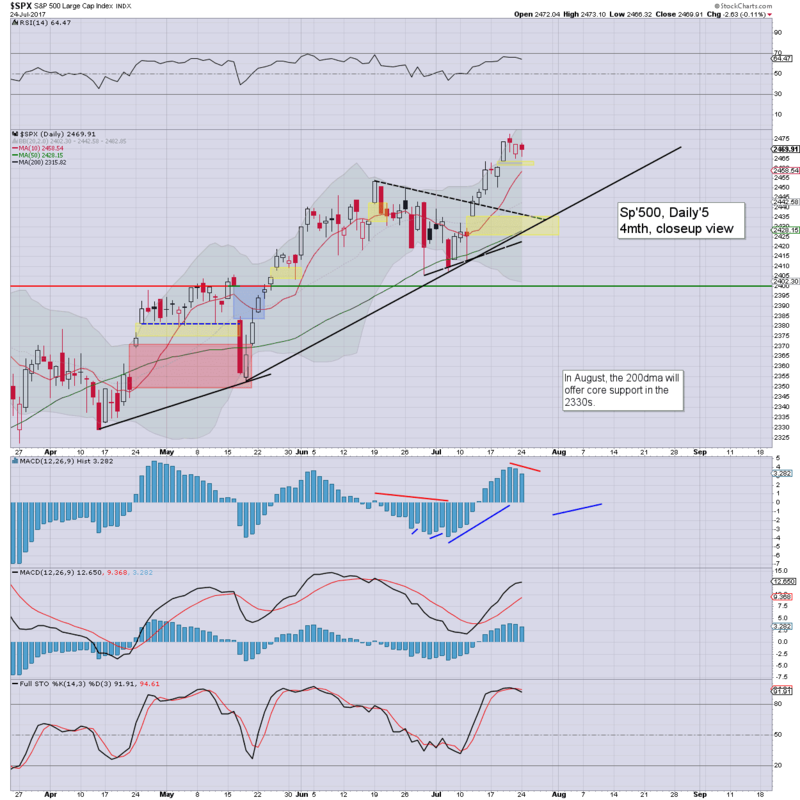 US equities opened on a fractionally weak note, and saw minor chop - leaning on the weaker side, across the day. The trading range was a notably tight 6.78pts. 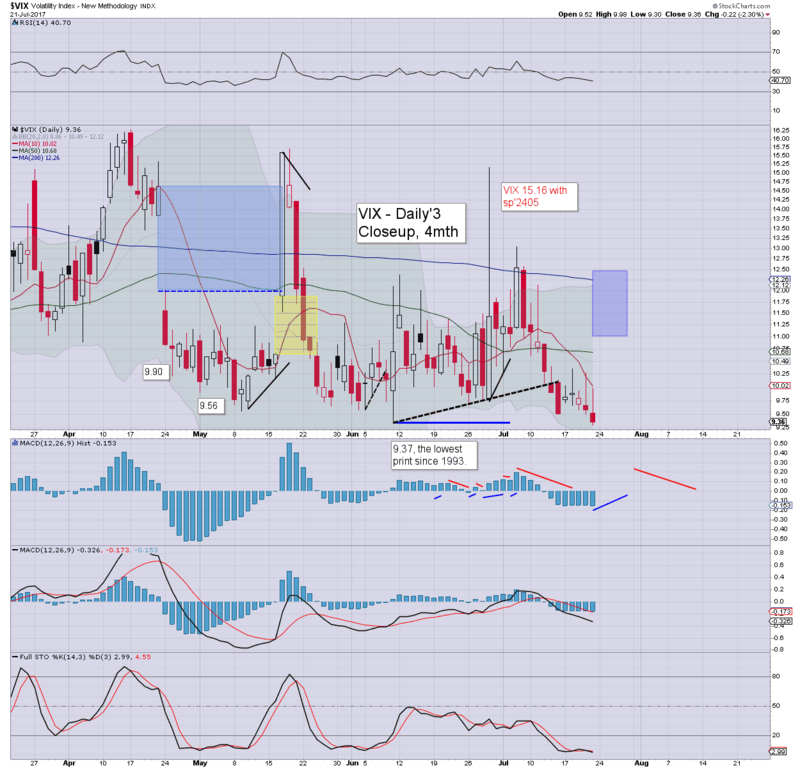 Market volatility remains exceptionally subdued, and its notable that the VIX broke a new HISTORIC low of 9.26 in the closing hour. Pretty incredible, as the 8s are clearly viable at any point. 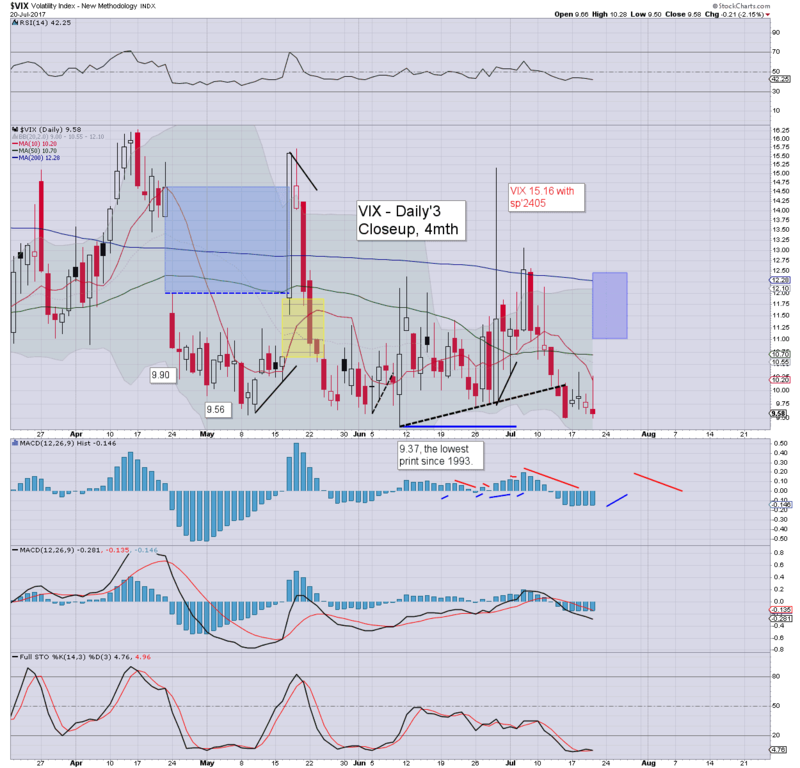 Best guess remains: near term weakness to sp'2430s - with VIX 11/12s, before resuming upward. US equities closed moderately weak, sp -0.9pts at 2472. The two leaders - Trans/R2K, settled lower by -0.1% and -0.5% respectively. 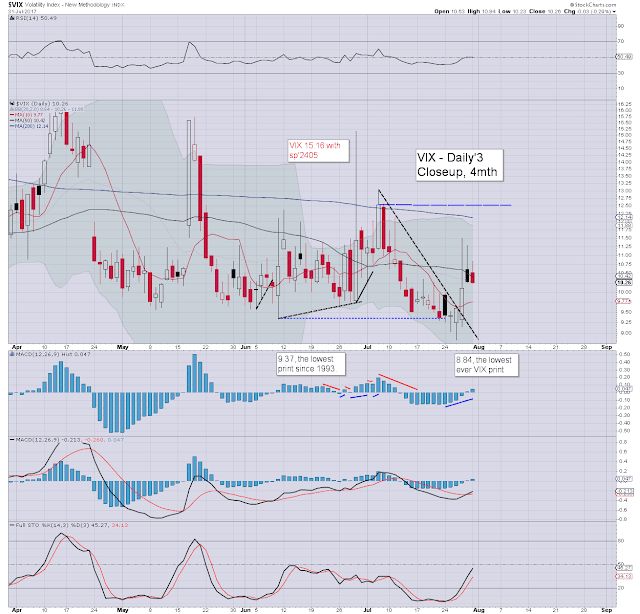 VIX settled -2.3% at 9.36. 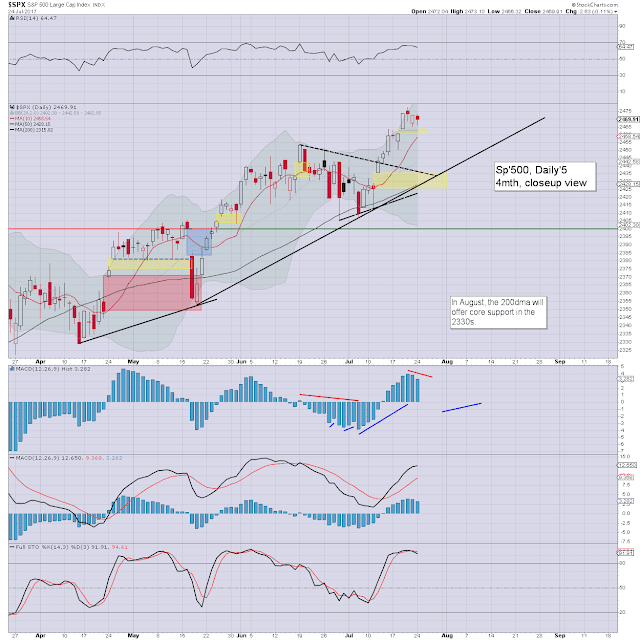 Near term outlook offers further weakness to at least partly fill the gap zone of sp'2435/25. Mid term outlook remains 'scary strong', as earnings are coming in reasonable. US equities opened a little weak, and saw chop across the day, but that was somewhat natural for what was option expiration. We have two entirely open gaps of 2463/60 and 2435/25. Some cooling to at least 2435 seems very probable by next Wednesday. Market volatility remains very low, with the VIX settling lower for a third consecutive day. Today's closing hour intra low of 9.30 is (I believe) the lowest EVER VIX. The daily/weekly close of 9.36 is the LOWEST ever daily/weekly close.